Switching to a paperless office isn’t just a move that benefits the environment by reducing waste, it also allows for a faster, more secure way to manage all of your documents and files. What Does “Going Paperless” Mean? Going paperless means that your business or organization is replacing the use of physical papers with electronically formatted documents. A paperless office uses these electronic documents and files to house their data. These electronic filing systems allow for increased efficiency and safety in document management as well as being a more environmentally friendly option. With a paperless office, your paper files are scanned and transferred to a document management system that works specifically for your business. You have instant access to any documents you need with a few clicks, rather than searching through filing cabinets and storage boxes. Business identity theft and data breaches are one of the largest concerns when it comes to operating a business. A digital document management system not only provides more productive tools for your employees, but also dramatically reduces the risks that comes with keeping your files in physical formats. Information held on papers are a much easier target for criminals to obtain. Even small businesses see more paperwork than they can handle. This can lead to papers with confidential information ending up in the wrong hands. By scanning and keeping your files electronically, there are no worries with rogue papers in your office. Passwords and firewalls guard your data, deterring those who would try to harm your business. 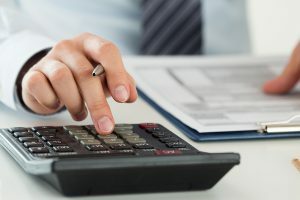 Even with all the benefits outlined for going paperless, you may be wondering if the conversion process is something that your business can take on financially. Converting to a paperless office is more affordable than you think, and professionals who’ve helped converted countless businesses have streamlined the process to make it faster and easier than ever. 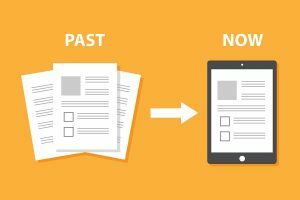 Using paper documents may seem like a convenient option, but they are quickly being filtered out in the new age of technologically-advanced businesses. A major concern with paper files is storage space. As your business grows, so do your files, taking up valuable real estate in the workplace and sacrificing much more efficient uses of the area. A paperless office allows you to keep all your data on secure computer drives that cuts down on space used to store papers. Using paper documents can also cause a huge increase in cost. 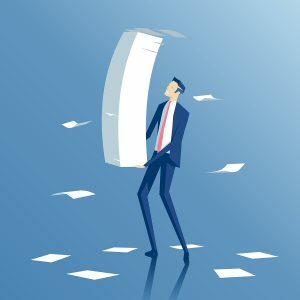 When using paper files there is a lot of time spent filing, locating, and indexing these files—taking time away from your employees. Toner, ink, and printer upkeep also take time and money from your business that could be better invested elsewhere. Lost files can cause headaches for your organization and even lead to some compliance violations. With physical documents, distribution takes time for packing and delivery, and incur further costs from postage and envelopes. Paperless offices can transfer documents immediately and without any cost. Offices that switch to a paperless environment see immediate benefits, including the ability to manage their documents more effectively with digital filing systems, eliminating the risk of data breaches from lost papers, and less waste created meaning a more eco-friendly workplace. Record Nations can help you convert to a productive and environmentally-friendly paperless office with local experts that have years in the business. To get free, no-obligation quotes or to learn more, give us a call at (866) 385-3706 or fill out the form on the right.